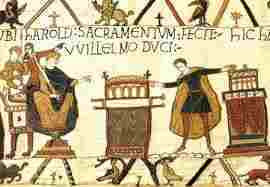 The Bayeaux Tapestry portrays William invading England. While King Harold awaited William’s arrival in the south, Harald Hardrada with Earl Tostig invaded England from the north (near York). 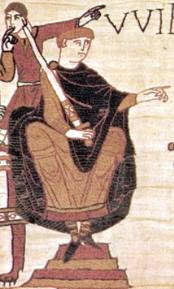 King Harold’s forces marched north and defeated the Norse at Stamford Bridge on September 25, 1066. Both Hardrada and Tostig died in battle. Harold then rushed south with his exhausted troops to meet his death at the hand of William and his Normans at Hastings on October 14, 1066. 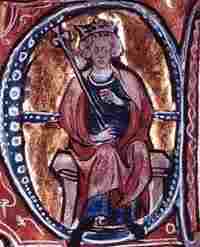 William was crowned king of England on Christmas Day, 1066 in Westminster Abbey. William rewarded his allies well and punished his enemies viciously. In the “The Doomsday Book,” a survey of land ownership taken in 1085, only two Anglo-Saxon barons that held lands before 1066 retained those lands twenty years later. About 4,000 nobles were displaced. The Norman landowners built primitive castles to defend their new territories. William built and improved numerous castles. Though extremely obese, William enjoyed excellent health until old age when he was impaled on the saddle of his horse in 1087 after a battle. The coffin was too small for his bloated corpse and when the attendants attempted to force it inside, the body burst. What a mess! !